Sleeps 20. 6BR, 5.5BA. K, K, 2Q, Q, 2S/BB, 2S/BB, plus SlprSofa. Lrg HDTV, Apple TV, 8CCTVs, 4DVDs, stereo, X Box 360 Kinnect gaming console, CD player, iPod docking station, WiFi, unlimited long distance. Gourmet kitchen, 2 ss refr., 2 ovens, 2 cooktops, 2DWs, icemaker, granite countertops. 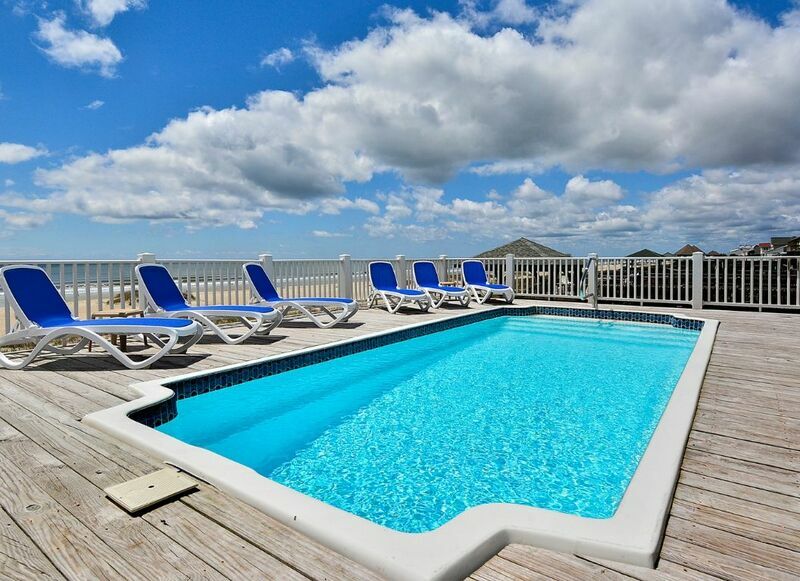 Oversized furnished deck, private pool, gas grill, outdoor shower. Wheel chair accessible BA, first floor suite. Elevator access to all floors. Swimming pool may be heated for addl $100/day Oct-May. All bed and bath linens provided. Non-smoking and no pets allowed. This is definitely a 5-star house as evidenced by my previous review. I chose 5-stars but it obviously did not save. The ladies from our church 16 chose this house for our 2nd annual beach retreat. It was great. We loved the elevator which made it so much better for us senior teens Quiet, clean, spacious Had a few gliches but the maintenance man came johnny on the spot and fixed the problem immediately. He was super nice too. We all were rested and happy and waiting for next year to go again. We have rented a big home for our extended family every year for the last two decades over the Labor Day weekend. Without a doubt, this is the best home we've stayed in. Everything is in great shape, the elevator was an answer to prayer for our aging mother, and the pool being off the main floor was Sooo perfect! And with a group of 20+ people, the amazing kitchen was perfect! Kudos! Been coming to OIB for about 12 years, this is by far the best rental!! Everything was wonderful:fully stocked kitchens, linens, beds, pool!!! Booked for next year, hope is well maintained throughout the year. What's not to like? We have been coming the same weekend ever year for over 20 years. The house is unbelievable. Probably the best house on Ocean Isle.